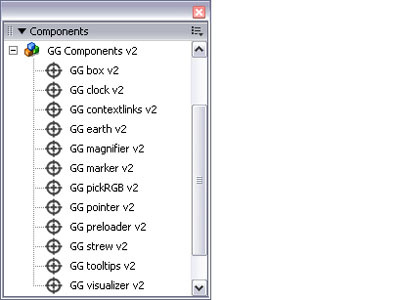 GG components is a free flash components extension package. You can use it for any purpose at no charge. By using the GG components, you can create many different animation effect or intractive application without using any script. You can access the GG Components from Components Panel in Macromedia Flash, menu Windows > Components, or shortcut key Ctrl+F7. An interactive 3 dimensional cube component, creates boxes using 6 movieclip symbols. User can click and drag to rotate it. idName The identifier of 6 exported movieclip symbols for 6 faces of box instance. dragable Define if user can drag the box to rotate it. smoothness Define the smoothness of movement [0,100]. An analog clock component. User can create many different style of client-side real time analog clock without any script. shading Specifies if the shading is applied. backgroundStyle The style of background [color, image, transparent]. backgroundColor Specify the color of clock background. backgroundImage The identifier of an exported movieclip symbol. innerBorderStyle The style of inner border. innerBorderColor The color of inner border. outerBorderStyle The style of outer border. outerBorderColor The color of outer border. numberStyle The style of clock numbers. numberColor The color of clock numbers. handStyle The style of clock hands. handColorHour The color of clock hour hand. handColorMinute The color of clock minute hand. handColorSecond The color of clock second hand. An actionscipt component, customize context menu for flash movie, creates menu items link to any URL. hideBuildInItems Specifies if build in items for context menu is hidden. costomItems An array of costom item. getURL URL to open when the context menu is selected. target target window to open URL. A spinning earth, with costomizable color, shading, and optional mouse drag control. land The color of the land area. ocean The color of the ocean area. control Define the earth spinning style. An interactive magnifying glass component, enlarge the view of a movieclip instance. targetMC The instance name of a movieclip instance on your stage. scale The scale percentage from original movieclip size to the large view. x x coordinate for the glass. y y coordinate for the glass. glass behavior Define how the magnifying glass move. glass size The size of magnifying glass. glass shading Specifies if the shading effect applied. A simple color picker component. Users can pick a color and apply to any movie clip instance. Users can pick a color from the provided swatches, or mix color using the RGB sliders. No any actionscript required. defaultColor The default color of the movie clip instance. targetMC Specifies the target movie clip instance to apply color. dragable Specifies if the panel is dragable. style Specifies the positioning style of the color swatches. x Specifies the X position of the color swatches. y Specifies the Y position of the color swatches. An actionscript component to create customized mouse cursor, crosshair, pointer trails, object trails and text trails. No any scripting required. originalCursor Specifies if the system mouse cursor is visible. crosshair Specifies if the crosshair is visible. crosshairColor The color of crosshair. crosshairThickness The thickness of crosshair. crosshairAlpha The alpha transparency value of crosshair [0,100]. pointer The identifier of the exported movie clip for pointer. pointerTrails Specifies if the pointer trails is visible. objectTrails The content for object trails. objectTrailsType Specifies the object type: none, movie clip, or text. objectTrailsQuantity The quantity of instance for object trails. textColor The text color for text trails. textSize The text size for text trails. textFont The font type for text trails. textBorder Specifies if the border is visible for text trails. textBorderColor The border color for text trails. textBackground Specifies if the background is visible for text trails. textBackgroundColor The background color for text trails. xPos The x distance from mouse pointer to first trails object. yPos The y distance from mouse pointer to first trails object. distance The distance between trails objects. A preloader component, shows loading progress in percent loaded or byte loaded. Can link to a movie clip instance, scales the movieclip instance or makes its’ playback based on the loaded percentage. Just place an instance of the component in first frame of your movie root, no any script required. progressMC Define the target movie clip instance to be linked to progress. progressMC_control Define the way to control progress movieclip. showDetail Define the type of loading detail, either percent, byte, or none. percentStart Allow the movie to start playing after how many percent loaded. useWaitCursor Specifies if the wait cursor is visible. fontFamily The font family of detail text. fontSize The font size of detail text. fontColor The font color of detail text. fontBold Specifies if the detail text is bold. fontItalic Specifies if the detail text is italic. A strew effects actionscript component, duplicate a quantity of movieclip instance to be located at any location on stage, or attached to any movieclip instance on stage, or attached to the mouse pointer. Strew objects can move across the stage, with blinking or fading effects, This component can be used to create screen effects or mouse effect, like raining, snowing, firework, starry sky, etc. idName The identifier of an movie clip linkage. strewFrom The location to place new duplicated movieclip instances. pointTarget Movieclip instance to attach strew objects. pointX y distance relatively from pointTarget. pointY y distance relatively from pointTarget. quantity The number of instances to be created. per 1 click. 0 for unlimited. velocity The moving speed for new duplicated instances. gravity The heaviness of the instances. randomSize Different size of new duplicated instances. randomAlpha Different transparency of new duplicated instances. scaleOut The scale out value. 0 for no scaling. fadeOut The fade out value. 0 for no fading. rotateOut The rotate out value. 0 for no rotating. An actionscript component, generate tooltips for any movie clip instance on your stage. Tooltips can be costomized text or movieclip. One component instance can generate tooltips for multiple movie clip instances. type Specifies the tooltips type, text (text tooltips) or movieclip (image tooltips). background Specifies if the text field has a background fill. backgroundColor The color of the text field background. border Specifies if the text field has a border. borderColor The color of the text field border. fontColor Indicates the color of text. fontFamily The font family for text tooltips. fontSize The font size for text tooltips. fontBold Specifies if the text tooltips font is bold. fontItalic Specifies if the text tooltips font is italic. objectList The list of instance name. contentList Text or movieclip identifier that assigned to related instance. A simple streaming sound loader with visualizer, volume control, and on/off function. sound The sound item identifier or the streaming sound URL/filename. source Specifies if the sould is a library item or external mp3. color The color of visualizer. defaultVolume The default valume level [0,100]. showVolumeControl Specifies if volume control is enabled.